Pablo Picasso’s father was an art teacher at the School of Fine Arts in Malaga, Spain. Beside the technical aspects of painting, his father must have taught Pablo how to analyze a piece and think through the creative process because very early in his career we see him studying his contemporaries in France. 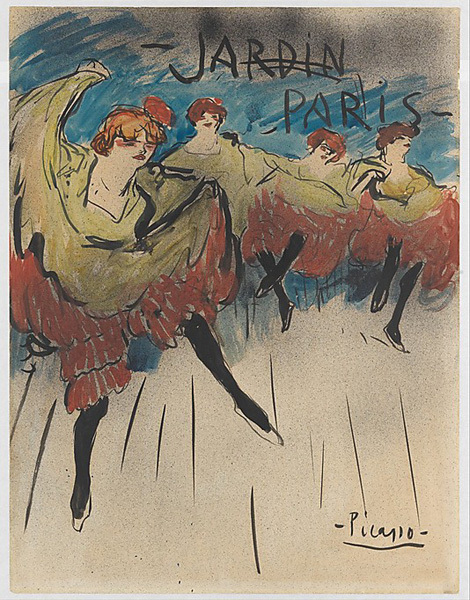 Pablo arrived in Paris around 1900 at the tail-end of the Impressionism boom. We can see that he is soaking in the styles around him but also building on them. Many figures in Picasso’s “Blue Period” are reminiscent of Velasquez and Manet’s beggars and street prophets. Also like these artist, the brushwork in these portraits is rich more realistic. There is evidence in the “Old Guitarist” that Picasso reworked and started over multiple times on a single canvas as he struggled and worked through a composition. As the story goes, Picasso saw an exhibit of African masks and was inspired by their sharp angles and broad surfaces planes. Pulling elements from Cezanne’s work, he incorporated these stylized faces into an abstract and flattened world “Les Demoiselles d’Avignon” completed in 1907. 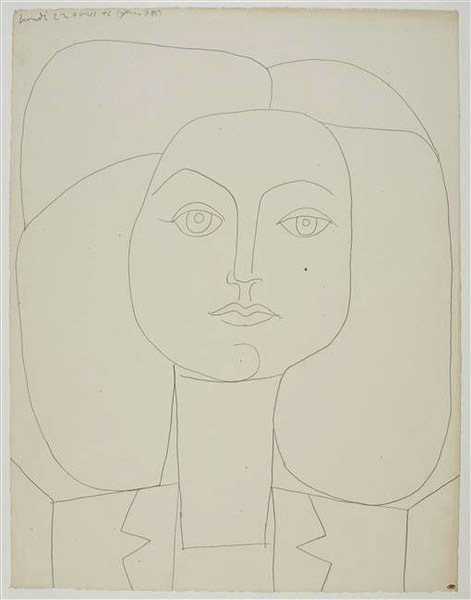 Elaborating on this design concept, Picasso along with Georges Braque developed an art movement called Cubism. They removed objects from a single point of view and presented viewers with a 2D yet multidimensional image. It was a radical departure from the tradition of Western Art and received mixed review. 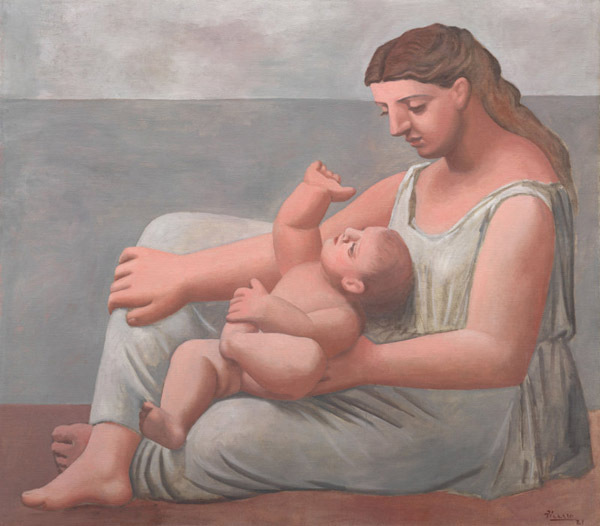 Picasso continued to explore Cubism for decades allowing this movement to evolve as he did. Analytical Cubism is the most radical form of this movement. Images are extremely abstracted such that the subject of the painting may not be apparent. Generally a very neutral palette is used. Later Synthetic Cubism pulled back from the extreme abstraction of earlier works and used more recognizable shapes. The subject matter became more clear but was still handled in a deeply stylized and angular way. Picasso continued to play with Cubism incorporating bright colors and curved elements. At times Cubist took on elements of Surrealist Art which was a great fit given that both movements look for meaning beyond what is natural or immediately apparent. Following WWI, Europe and its art community felt traumatized. 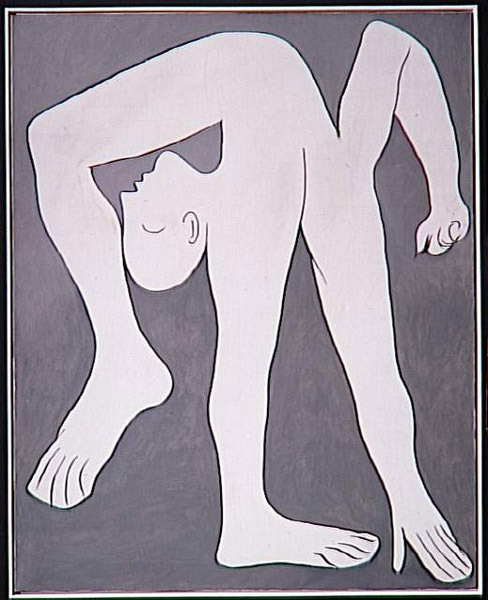 Picasso moved away from the mechanical and abstracted toward a more classical style. His paintings in this period were populated with thick women with classical features and ancient Greek clothing. Figures were placed on beaches or peaceful neutral environments. Picasso spent must of his later life along the French Riveria. Reflecting the joy of beach life, his works were filled with happy fawns, women and dancers enjoying the sun. His style during this time condensed significantly with simple lines and colors transmitting the figures, scenes and emotions. There is less Cubist influence in these pieces because the paucity of each image required more deliberate representations. During this period, Picasso selected a subject and drew it over and over, each time condensing more and more of the image. You may be familiar with the Bull series done in 1945, but Picasso also drew figures and his lover Françoise Gilet in this way. While Picasso had worked with sculpture throughout much of this career, he worked with the Galerie Madoura to create many ceramic pieces that were reproduced in limited editions. There are Picasso Museums in Paris, Malaga (his birthplace) and Barcelona. Since Picasso was incredibly prolific, you can see examples of this work at most major metropolitan museums. Given this vast contrast of styles he used, you shouldn’t be surprised if something that doesn’t “look like a Picasso” actually is by him after all! Erin of a Sense of Place – What’s with the Wall Colors? And thanks for the kind introductory words, Christina! We’re very psyched being part of the group, there’s so much knowledge to learn from! Welcome again! I’m excited to have you and Lydian joining the Roundtable! It’s amazing–out of all the works you’ve shown here–the number of Picassos that have come to visit us here in Toronto. I just saw “Le Moulin de la Galette” (gorgeous) which is still here at the Art Gallery of Ontario, straight from the Guggenheim, in an exhibition entitled The Great Upheaval: 1910-1918. I can’t say I love every one of Picasso’s periods but there’s no denying his genius. Understanding Picasso is so necessary to getting anyone else that followed. Terrific post, Christina! Thanks Lesley! You’re definitely right, Picasso was instrumental in the birth of modern art and you need to have an understand of this work to analyze what came after. I’m also glad a steady list of his works have made it to Toronto! After reading your post I’m suddenly really eager to travel to one of the Picasso museums here in Europe 🙂 Thanks for putting this great overview together, Christina! Although Picasso’s versatility crossed my mind occasionally when coming across one of his works, I’ve never seen that many of his works together. Time to do so! I only heard about his ceramics work a year or so ago by watching the auction market, but I really like that stuff! It’s not art history heresy to not be a huge picasso fan … as long as you still don’t like Rocco you are fine 😉 I much prefer his later cubism and simplified, beach scenes. He had such a huge range. Living in Canada, I have only come across a few of his works mostly in Toronto and the Peggy Guggenheim in Venice. But I am with Erin on this one, his works don’t seem to capture me like Cezanne or even Miro. I do enjoy some of his colour choices on the other hand. 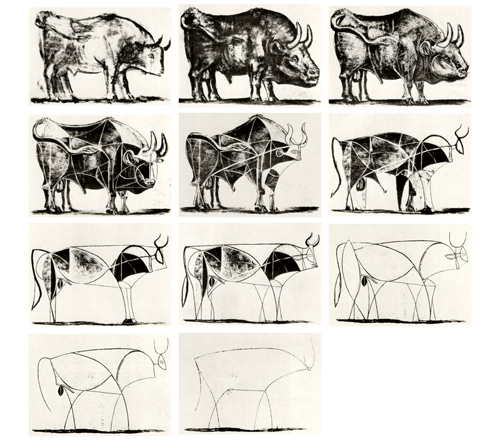 Nice overview of Picasso’s work! I have to agree with a couple of the other comments – not a huge fan of Picasso, haha. I did visit the Picasso museum in Paris, but decided to skip the one in Barcelona. There is such a thing as too much Picasso! The exception is Guernica, which I thought was quite moving and deserves all the praise thrown at it. Overdosing on Picasso! haha! The Picasso Museum Paris is supposed to be pretty good. (I think the collection was given to the government in exchange for taxes owed.) Guernica is definitely intense, I hope to see it in person someday. It’s kind of funny that the person who made such a power image about the horrors of war also made frivolous little fawns. No that’s “Contrast”! I’ve always been amazed that Picasso has so many distinct styles. While I don’t love them all, I do have several prints hanging on my walls, the Dove of Peace among them. 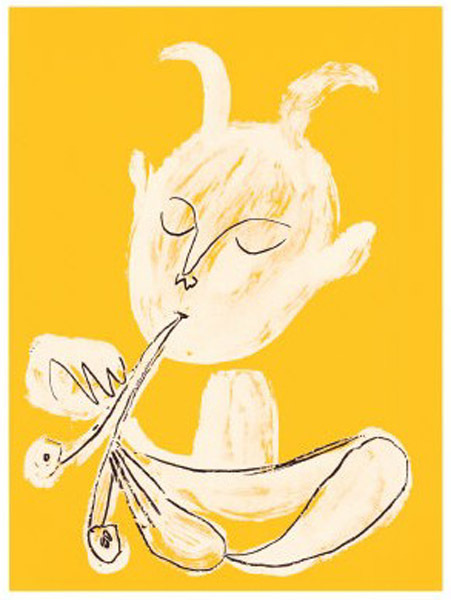 What a superb dossier on Picasso! I feel like I’ve just been through an entire course on the works of Pablo Picasso and loved learning about his various styles and the transitions from one to the next. He certainly knew how to explore and experiment with new styles and love the fact that he pioneered the Cubism movement! While I prefer a more classical approach in art, I can’t help but be pulled into his works…truly fascinating each and every one of them. Of all the works presented here, I think the “While Fawn” is my fav. By the way, should that read “white”? Forgive my ignorance. Above all, thank you for a truly enriching look into the life of Picasso! You are indeed an erudite lover of art! !